Some of the places we go are right off the Interstate, others take some ferreting out and are out in the middle of nowhere, or as Jeanne likes to say “way out past where Jesus lost his sandals”. Some of the places we go turn out to be emotionally charged, really relevant to our lives and memories and are just special. 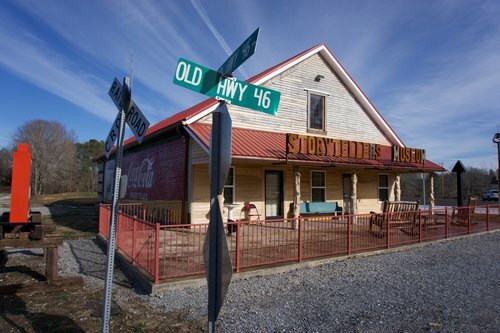 The Storyteller’s Museum and Hideaway Farm are an absolute must for Johnny Cash fans and really, all serious music fans. The Farm is 100+ acres with a history dating back to the Revolutionary War and fell into Johnny Cash’s hands in an offbeat, way in the 1970’s. If you are old enough to have seen his 1976 Christmas Show then you have already seen the farm. After his death the land was sold and the building he used to own a mile down the road fell into disrepair. 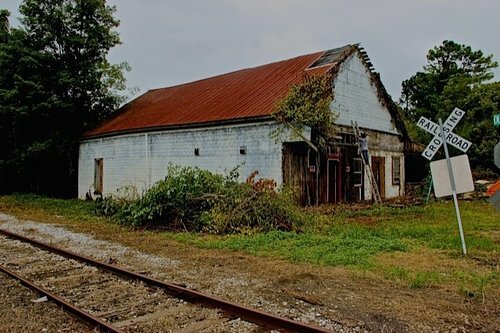 Once a general store, later a spot where Johnny often performed and hosted parties, and was even a recording studio almost disappeared forever. Today when you visit, you will likely meet some of the Cash Family and the owners of the farm, the Oxleys who are so close it seems hard to tell who is from which family. Thomas Gabriel, Johnny’s grandson and musical dopleganger now tours with one of the Oxley family members on bass. We were lucky enough to meet Mark Alan Cash, Johnny’s nephew, and he played a few songs for the four of us on the same stage his uncle played on! Wander through the restored building and you can lean on Colonel Parker’s bar (think Elvis’s manager – yes, you can sit at the same bar as Elvis), sit at Minny Pearl’s dining room table and have your eyes pop out at the actual One Piece at a Time car. A tour of the house that the Cash family used as it’s country hideaway is as unique as the museum. Again, guided by a family member you are taken room by room through the house, watch family movies, see Johnny’s room which is still stayed in today by his visiting children and special guests. Nothing is off limits – sit in his chair, and his throne….yes, you can poop where Johnny Cash pooped. Out back is, among other things, Johnny Paycheck’s limo, the last car Johnny Cash drove ( a Mercedes) that his grandson drives to this day, and a beautiful chapel and concert space that we were fortunate enough to see Thomas Gabriel play his national tour kick off concert in!! An inspired and simple chapel, it is available for rent and used by locals and Nashville royalty alike. A member of Garth Brooks band was married there a week before our visit and Garth and Trisha signed the wall of the house in Johnny’s living room. Keeping the place a fan’s museum, anybody visiting who is a musician is encouraged to sign a section of the hallway, making them a part of the man in black’s home. Also featured in the museum is a growing collection of folk art. Three dimensional art which is composed, in part, by physical objects owned and used by the subject. Chris Stapleton’s fishing gear, Johnny Cash’s records, and something of Dylan’s, but I forget what. As a county music fan who loves the history and connection between fan and artist, this is a truly special place that continues the tradition of the Cash and Carter families, be it the music, the connection to every man, or the stories. Listen to some Thomas Gabriel here and tell me he doesn’t sound like his granddad! Wanna hear more? Visit us at our Facebook page as we broadcast some live!